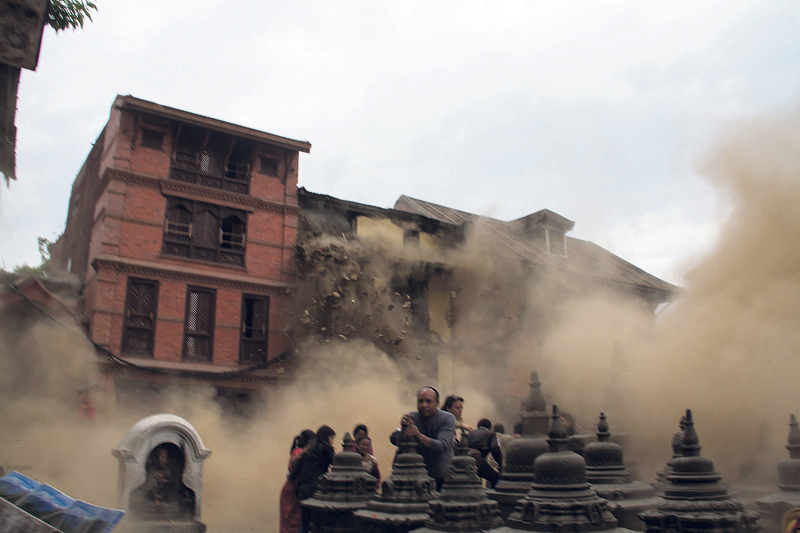 Photo Courtesy: PJ Club This picture of collapsing houses at Swayambhunath Stupa premises taken by Dipak Ratna Bajracharya won him Rs 100,000 award in a photo contest organized by Photojournalist Club. 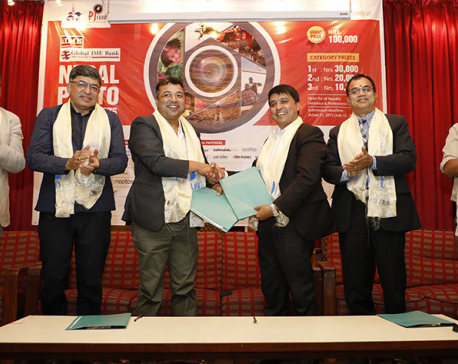 KATHMANDU, July 30: When his name was announced as the winner of the annual photo contest organized by the Photojournalist Club, contrary to all expectations, silence filled Rastriya Nachghar's hall, which was teeming with photojournalists and photographers. Soon, a murmur ensued. "Who is Dipak Ratna?" the crowd started asking. The winner of the award worth Rs 100,000 himself was making preparations for the evening aarati at Santaka Temple at Te Bahal, Kathmandu. 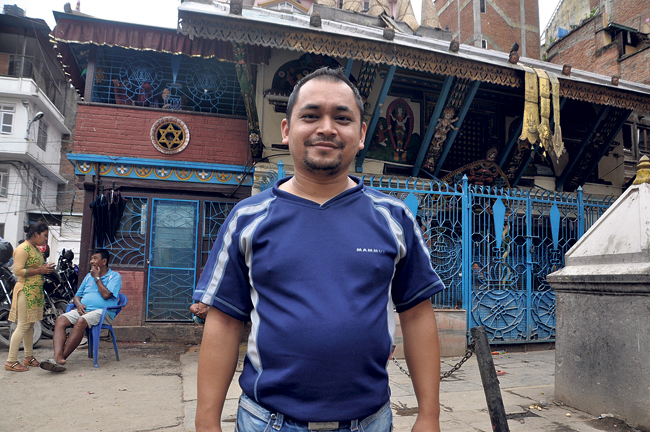 Dipak Ratna Bajracharya, 35, is a priest by profession but he started taking interest in photography around five years ago. He loves traveling to hilly areas and is passionate about photography, with special liking for capturing landscape. That's why he never forgets to take his camera along wherever he goes out. 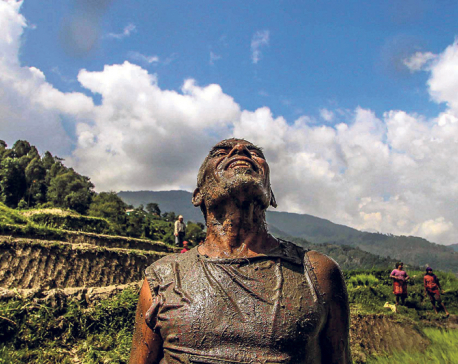 He had purchased his Canon 7 D camera only two months before the devastating earthquake that struck Nepal on April 25. He said he had been to his sister Kamal's house in Swayambhu for attending a puja on April 25 last year. And as like always, his camera was with him. He and his young nephew frolicked around Haratimata Temple and were taking photographs as the puja was underway. “Then, all of sudden the earthquake occurred. Everyone around us started running out of fear,” he said, recalling the situation during which he managed to capture the award-winning moment. He took the picture risking not only his life but also that of his nephew who was clinging to him. “I was clutching my nephew with my one hand and holding my camera with the other one. Even while running for life, I could not give up my passion,” he said. He said he captured the collapsing house in just one click. He said it was the first time that he had participated in the photo competition and did not expect to win any award. “To be honest, I had not expected my photo to win an award. I feel overwhelmed with happiness,” he said. He knew about his success only after PJ Club telephoned him at around 3 pm on Friday to inform about the results of the competition. He said he took part in the contest after his friends insisted on doing so. He said the success has encouraged him to continue his passion for photography.